Quality building products can prevent undesirable occurrences which can affect our homes, offices, health and well-being. This is particularly important in our country which is under the constant threat of earthquakes and hurricanes. In Trinidad and Tobago, clay blocks are popularly used in residential and commercial construction. Due to its popularity, it is important that this building material be regulated to ensure continued conformity with required standards. 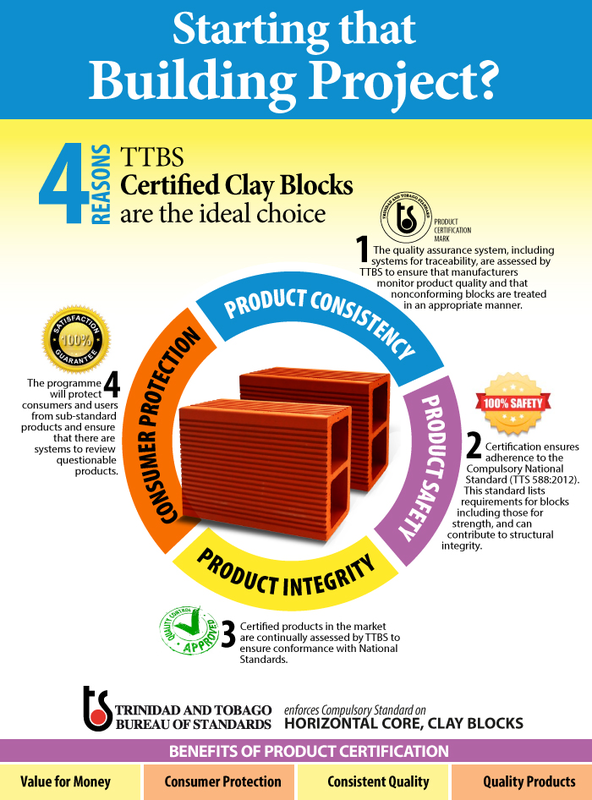 The quest to ensure that clay blocks in Trinidad and Tobago are of acceptable quality, has led to the development of the National Compulsory Standard, (TTS 588:2015 — Hollow Clay Block – Horizontal Core – Specification). This standard outlines requirements for the clay blocks, including those related to strength, size and dimensions. As a National Compulsory Standard, these requirements will be mandatory and enforced by Trinidad and Tobago Bureau of Standards (TTBS), as declared in the Standards Act No. 18 of 1997. In the very near future, these products will have to be certified in order to remain in the Trinidad and Tobago market. The certification process involves testing of the products and an evaluation of the manufacturer’s quality assurance system. Systems related to standardization and conformity assessment are part of the National Quality Infrastructure (NQI), which is intended to improve the quality of goods; protect health, safety and the environment; and ensure industrial efficiency and development.